A tutorial on animating a tornado kick, created for 3D Artist. The tutorial was created in 2014. Let’s start by bringing in our reference so we can work alongside it in Maya. Go to Panels>Orthographic>New>Front to create a new camera. Call this ‘referenceCam’ and in the active viewport go to View>Image Plane>Import Image and select frame_01.jpg from the Reference Images folder. Under Image Plane Attributes, edit the Display to Looking Through Camera and also check Attached to Camera. Now translate the reference camera away from the main scene and have the view as a floating window by going Panels>Tear Off. Now I’ll now scroll through the timeline and put in all the key poses – of which there will be many – using the red images from the reference as a guide. Here I’m mainly looking at making sure I put in all the contact poses for the feet as they shuffle around to get a better balance. I will also want to make sure that they are following the translation and orientation of the hips as the body spins. At this early stage I want to make sure I get some interesting and strong poses happening, as well as playing with opposing lines, such as those created by the hips and shoulders and the reverse C-shape in the spine. Try and think about which body part is leading and which will be following at this stage. Later on we can think about delaying some body parts to loosen the move up. For the second pass through, I will start adding in a breakdown pose between each key pose. Adding these poses will enable us to better anticipate how the animation will look when we transition from Stepped tangents to either Spline or Auto tangents. As the character is also spinning and we are working with the legs in IK mode, we can also start creating the arcs that we will need to finesse later on. Focus on the path of action of each limb so they flow from one frame to the other without any sudden popping. We can also begin to indicate principles such as drag on the hands and toes, as well as anticipation in the earlier poses to enable the audience to become aware of what will come. Once all the main poses are in, I’ll go through and create a playblast of the animation. My main aim here is to check that the poses are clear and readable and if the action is too fast, too slow or possibly even just right. I like to stand back from my monitor when doing this, as I think it reveals quite a lot that we just can’t see with the screen right in front of us. 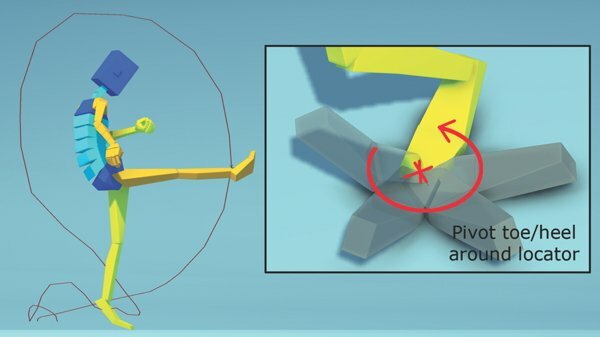 In doing so, I find that in my animation I need a few extra frames on each spin, as they occur too fast and cause some popping – especially when the legs cross for the first time. To add the extra frames, I select all the controls and open up the Dope Sheet, which you can find under Window>Animation Editors. In the Dope Sheet Summary bar at the top I grab all the keys that I need to move along in order to give me the extra frames and push them to the right. Once you are happy with the timing, select all the animation controls and convert the tangents in the Graph Editor from Stepped to Auto or Spline mode. As always, I begin from the core out when refining, so my first port of call will be the hips. For this move, I’m mainly using the root_ctrl for translating the character up and down and rotating him, and the hip_ik_ctrl to get some extra rotation in the hips, if needed. I start by going through and deleting any keys that are not doing much for the animation or adding too much noise. We can then go through and try to mimic the motion and arc we would expect to see on a bouncing ball. Also you can add extra keys if you need to get the arcs flowing well in other areas as he shifts his weight about. Remember, it’s all in the hips, so getting this as refined as can be will be crucial for all the other elements. 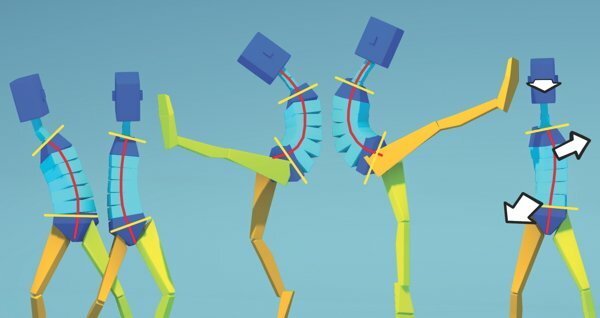 In this move the big arcs will be created by the legs, so as I am working in IK mode for them I will most probably end up setting a key on nearly every frame, especially when the legs are in the air. Be sure to create motion trails – not on the controls, but on a vertex on the model, such as the ankle or the end of the foot. This will create an honest representation of the arc being created by the leg’s swing. As the feet will pivot from the toe or the ball, it’s also important that when this happens there is no popping. I like to create a locator at the point where the foot will pivot from and use that as a guide to position and orient the foot. If we don’t do this, and the foot slides around, we will lose believability in our animation. We’re starting to work up the torso, so as all the upper limbs are children of the spine, we’ll start there. Again, begin by cleaning up the curves and getting rid of any keys that aren’t helping. Push the shoulders and hips to really get some striking poses from opposing lines. Also, add twist to the torso, orient the chest in one direction, the hips in another and the head in a third direction. This will add further interest to the poses and make them more dynamic. Try to delay the neck and head slightly and make sure the path of action on the head is smooth and clean as it swings through. When dealing with the arms, I like to work on them separately as I can really fine-tune one arm without the other distracting me. I use selection sets to hide some of the geometry and focus on those arcs once more. Although the arms will follow the torso, we will still need to go in there and clean out some of the poses as they may be jittery in places. Also, make sure to edit the spacing, as in some instances, for example, when the right arm reaches its peak we will want to ease in and ease out of the key pose to reduce what could be some very quick movement in a small number of frames. At this stage I want to make the motion as smooth as can be, as well as begin offsetting some parts so we don’t come to the final pose and hit it as one lump. I’ll delay the arms by a couple of frames from the spine and in the odd frame I will also push the lower arm further back than naturally possible to really help sell the drag. I’ll then delay the hands and also really push the fingers back to help sell the path of action that they’ll be following. To loosen up the approach to the final pose, I’ll make sure the arms hit the pose a few frames later and also have one arm hit the final pose a frame or two before the second arm does. As we hit the final frames, we’ll want to keep the motion and the character alive. To do so, we can employ the technique of using Moving Holds. For the hips, the upper body and the arms, I will add a small amount of motion, continuing through to the final frame. It’s important to keep this motion moving in the direction that the body was travelling. The change in movement from the final pose to the final frame may be barely noticeable, but the difference between subtle movement and no movement can be huge to the naked eye. Happy animating! When animating, I like to zone in to a particular aspect without my mind being side-tracked by things that can be resolved later. For example, when cleaning up the spine, I don’t want to look at the arms or possibly even the legs. To help me work in this manner, I use selection sets. Simply grab all the geometry that you want to hide and go to Create>Sets>Quick Select Set. By the end of the animation, I have a selection set for each arm, the head, the spine and the legs. To select the geometry within the set, either go to the Outliner and open up the specific set you want to hide/unhide or go Edit>Quick Select Sets to pick the group.